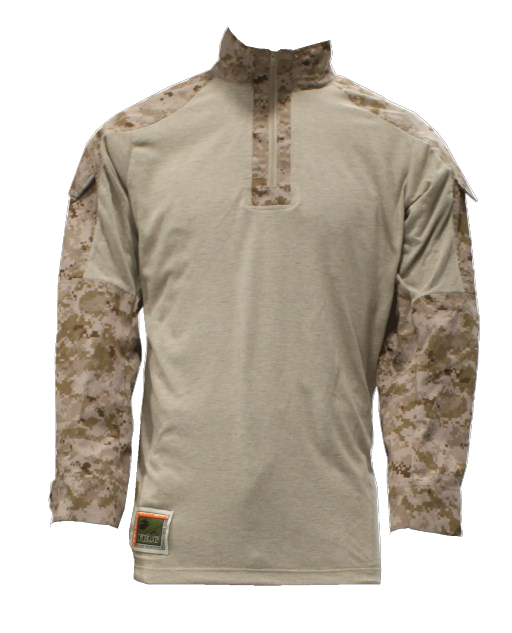 The blouse features moisture wicking torso, zip collar, raglan cut sleeves for improved mobility, comfort and durability. The sleeves contain angled bicep pockets with loop panel located on flap, darted elbow panel reinforcement, three position button closure cuff. The trousers features elasticized waistband, button fly, angled side slash pockets, seat pockets with flap closure, large thigh cargo pockets feature elastic reinforcement and bellowed expansion, double reinforced seat and knee, and dual calf pocket with bellows. Crye Precision LLC., Brooklyn, N.Y.